Marginal light doors are slender glazing bars can be a tricky process maintaining the original look of the original doors. 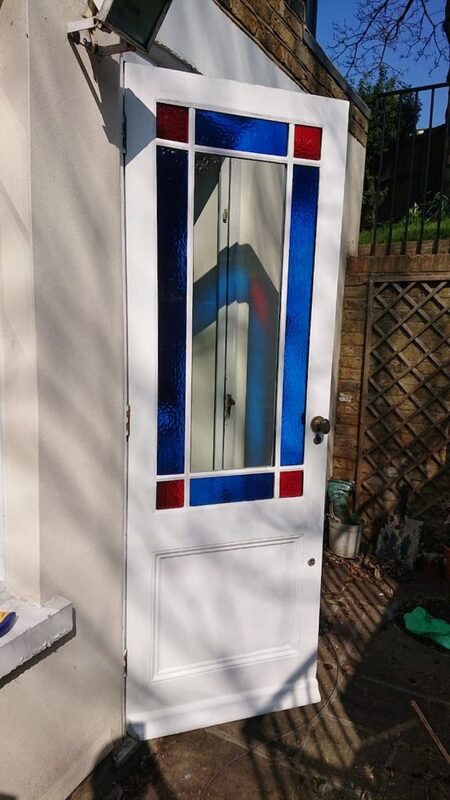 These doors already had stunning textured and coloured glass in place prior to install of the thin double glazing and already looked beautiful; the hardest part of this project was to ensure that we didn’t lose the elegancy and overall look. 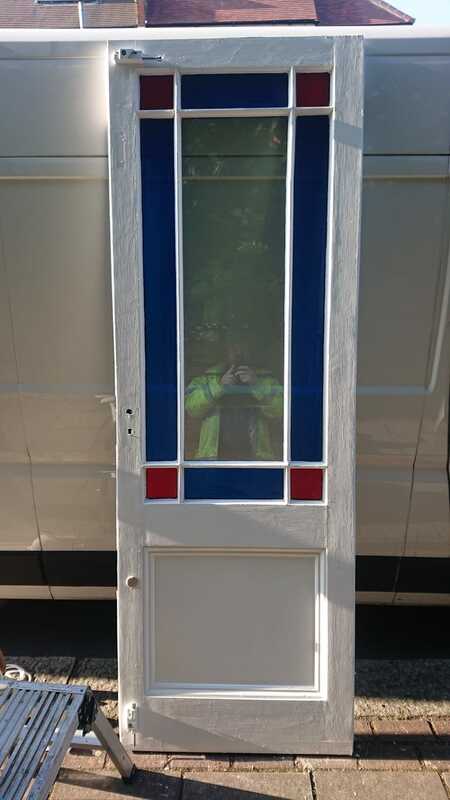 Where we are installing multiple units into an original door, it’s not as simple as dropping one double glazed unit into the frame and then laminating the bar externally as we would normally do with typical original sash windows that we double glaze. This door required the bars completing deconstructing and then rebated deeply enough so that the thin double glazed unit can fit correctly. 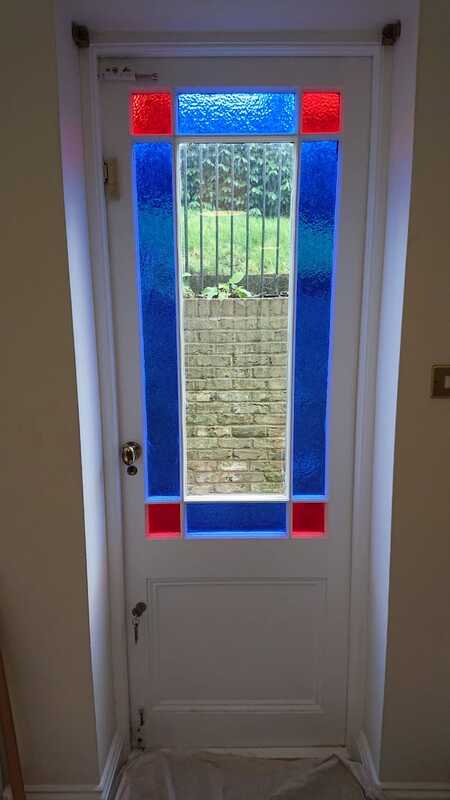 Here’s a look at the doors with single glazed colour glass. As you can see there are nine units on each door, so running down these bars was a slow but necessary process to keep the doors looking original. Where the double glazed units have just 7mm sight lines(this is the part of the unit which joins the glass with the spacer bar). This is the unsightly part of the unit which we aim to hide within the glazing bar, only displaying the glass if at all possible. On occasion a frame that isn’t perfectly square will show some of the back edge of the unit but for the most part they won’t be seen. On this door however, with marginal light, where there is so much glazing bar, hiding the unit was absolutely critical. Once we have run the glazing bar, we then need to rebate around the outside of the frame. This is done with the rebate cutter and the depth set exactly set as required, which in this case means the depth of the slim double glazed unit plus the glazing bead externally itself. It’s important to not rebate too deeply; you will end up with the situation where the glazing bead externally isn’t flush. Here’s a look at the windows with units install but still requiring making good. This is simply calculated by the unit depth plus which ever glazing bead depth we deem most suitable. We always try to keep the glazing bead as slender as possible so that we minimise the amount of overall timber that we remove from the original joinery. This helps to improve the structural integrity by not penetrating any of the mortise and tenons. The deeper you cut into the structure, the more likely you’ll need to cut close to the mortise and tenon which you want to avoid as it’ll weaken the structural integrity of the sash. This is one of the key benefits of thin double glazing when comparing to a standard double glazed unit. Once the rebate is completed, it’s a case of carefully installing the thin double glazed units into the rebate we cut. We are meticulous in ensuring that the units have been bedded in properly with sealant because they need the additional insulation in order that they’ll hold for a 5 or 10 year guarantee as required. If you don’t fit the thin double glazed units in with the correct sealant then they may break down before the warranty period is up. Once the units have been correctly fitted it’s a case of laminating the glazing bar externally. The internal glazing bars are actually completely rebuilt and not laminated. The external glazing bar assembly is laminated to the units and aims to replicate the original look as much as is possible. Due to the small depths of the glazing bar, this is the only aesthetically pleasing way of rebuilding this type of joinery. The glazing bars are then appropriately sealed in and primed/undercoated. This is the typical condition we leave the door normally, unless of course, a customer has requested that we offer a painting service as well. The doors are then simply rehung and draught proofing system installed in the door as well. These doors also needed a little bit of repair as well. It’s quite common but the lower part of the door has a little bit of rot, over the years generally speaking, moisture sits very typically on the tread of a door frame and this normally results in the door absorbing some of the moisture. If this is a prolonged exposure, then you’ll end up with a little bit of rot in the lower section of a door. It doesn’t necessarily mean that you need to throw the door away entirely or replace, it’s just a simple case of splicing out and repairing as necessary. In this situation we needed to replace the weather bar and do a little bit of filling to get the thing up to a structurally good standard. When we make any door structurally good, it normally follows the same pattern as sash window repairs; we splice out and make structurally good, and then we typically use resin or epoxy that binds the repair fully. External of door with new weather bar fitted and lower rail repaired. 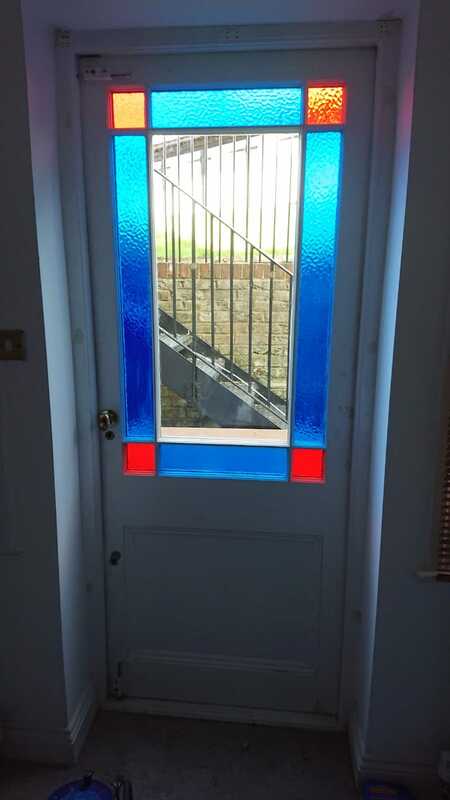 As far as repairing the door is concerned, we typically like to effect repairs and prime and undercoat leaving ready for painting where necessary. We don’t prepare the whole door, just the affected area that has been treated and repaired. 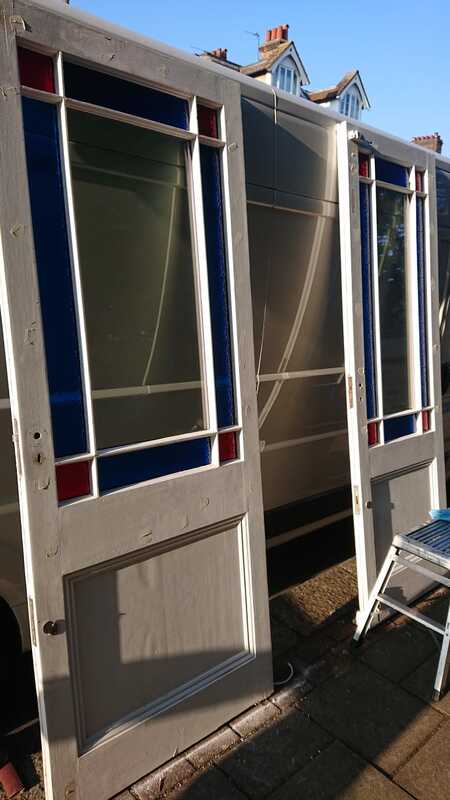 Unless our painting service is specifically requested, then there’s certainly a little bit of painting sanding and filling to go as you can see from the pictures the doors look great and almost as good as originally but with all of the benefits of modern technology installed too. 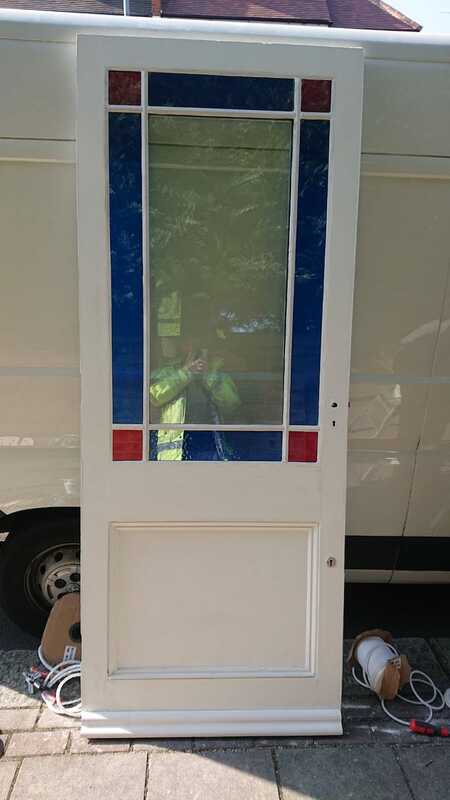 what are the most important things to consider when having a marginal light doors double glazed is the fact that we will need to take the pie out of the workshop. There’s such an extensive amount of glazing bar that needs to be run down and repaired that doing so on site would be far too time consuming. Ultimately running the doors back to the workshop to save time and money for you. But please bear in mind that there is a reasonable chance that we will have to board up your door for one night. In this particular example we needed to board the windows up for one evening. If this concerns you, then this might not be a suitable option for you. Another consideration that you might want to bear in mind is that a thin double glazed unit isn’t as effective or secure as the standard double glazed unit. But this is the trade-off between having a beautiful looking door and one that’s totally efficient. That said, thin double glazing is a pretty good in terms of efficiency, it’s just there not as great as standard units. In this situation though, where you’re trying to balance aesthetics and performance. it’s a no-brainer to use thin double glazed units. It’s well known that thin double glazing has its vulnerabilities, and one of the biggest issues is making sure that the sealant that you use is well bonded around the edge of the unit, to help with protection. It’s not like a stand-alone unit that can last 10 or 15 years, it really needs the help of a sealant and the putty or glazing bead to bond and protect the edge of the unit as well. This reliance on sealant means that is absolutely imperative once the door has been double glazed, that the putty or glazing bead is fully decorated in to ensure that no moisture or air can penetrate around the edges of the joinery. If you don’t get any moisture or air penetrating then the unit itself won’t be exposed and therefore will just last indefinitely. How it will look when we finish up. Here’s a look at how the doors finished up. If you look closely you can see that they really don’t look an awful lot different to the single glazed originals and this was exactly the result that I was hoping to achieve prior to installation of the units. Overall, this is an excellent upgrade to the property and with the sashes either side being double glazed as well, this makes for a really thermally efficient room and it’s considerably operated the security as well. If you’d like to investigate the possibility of having double-glazed marginal light doors then please feel free to pop us an email or call us today and we’ll go through all of the options and run through some of the costings as well, Or if you prefer to be take a look at our sash window prices page which also list the cost of door repairs as well.